What a terrible way to start off the year. The Dow lost 1,079 points this week, or over 6%, as fears about China and crashing oil prices dealt Wall Street a painful one-two blow. It was the Dow's worst five-day start to a year on record, according to Dow Jones. Despite the relative calm in China and a strong U.S. jobs report, the Dow fell 168 points on Friday, while the S&P 500 and Nasdaq lost about 1% apiece. It capped off the Dow's biggest weekly percentage loss since 2011. "People are very nervous. We have a lot of fear about what is going on in China," said Joe Saluzzi, co-head of trading at Themis Trading. Investors were once again spooked by crude oil prices, which plunged to the lowest level since late 2003 on Thursday. Oil initially calmed down on Friday before retreating again. Crude finished the day at $33.16 a barrel, its weakest settle since February 2004. Related: Apple stock plunges below $100: Next stop: $65? When oil drops, so do energy stocks. They retreated again on Friday, with names like Valero (VLO) and Marathon Petroleum (MPC) falling more than 3% apiece. The oil plunge was one of the main drivers behind this week's market selloff, which erased nearly $1.1 trillion from the S&P 500, according to S&P Dow Jones Indices. Chinese stocks started the year with an epic 12% nosedive. The selling earlier in the week triggered "circuit breakers" that are designed to smooth volatility in the markets. 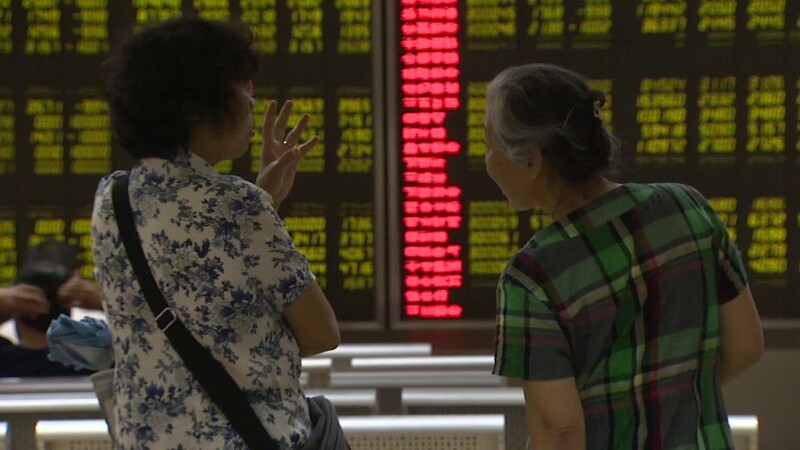 Trading in China was halted twice this week -- on Thursday, the stock markets shut down after just a half hour of trading. Sentiment was boosted after regulators scrapped the circuit breakers because many believe they were fueling sharp trading losses -- rather than taming them. Investors cheered as China stopped allowing its currency to lose value. In fact, China's central bank raised its target rate for the yuan for the first time in over a week. The surprise decline in the yuan has raised fears of a currency war of competitive devaluations. On Friday, China managed to pull back from the brink and the benchmark Shanghai Composite closed 2%. On Wall Street, investors initially responded favorably to the latest evidence that the U.S. economy continues to chug along despite the global turmoil. The government said the U.S. added 292,000 jobs in December, easily beating expectations. It capped off the second-strongest year of employment gains since 1999. Importantly, wages went up 2.5% last month, matching the best gain in six years. But there are lots of signs of the rising fear on Wall Street. CNNMoney's Fear & Greed Index is now flashing "extreme fear," a dramatic reversal from "neutral" just a week ago. Gold, which tends to rise during times of financial stress, was one of the only things that had a good week. The precious metal soared 4% to $1,103 an ounce. Billionaire George Soros was among the most prominent investors to say the current situation reminds them of the 2008 financial crisis. Others think it's much more like last summer, when turmoil in China prompted a scare in U.S. stocks that proved fleeting. "We don't have investment banks failing or a credit crisis going on. This will settle. It reminds me a lot of August right now," said Saluzzi.